Benjamin Louis "Ben" Cardin (born October 5, 1943) is an American politician and member of the Democratic Party. He serves as the senior United States Senator from Maryland, in office since 2007. Before his election to the Senate, Cardin, who has never lost an election, was a member of the United States House of Representatives, representing Maryland's 3rd congressional district (1987-2007). He also served in the Maryland House of Delegates (1967–87), serving as Speaker (1979–87). He was the youngest Speaker in Maryland history. 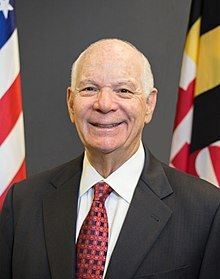 Cardin was elected to succeed Paul Sarbanes in the 2006 U.S. Senate election, defeating Republican Michael Steele, the Lieutenant Governor of Maryland, by a margin of 54% to 44%. He was re-elected in 2012 with 55% of the vote. He became the senior Senator on January 3, 2017 upon Barbara Mikulski's retirement. This page was last changed on 29 June 2018, at 06:40.